Natural gas is a naturally occurring hydrocarbon gas mixture consisting primarily of methane. Natural gas is an energy source which provides both heating and electricity. Natural gas is currently the cheapest form of fossil fuel since it is price regulated by the US government. 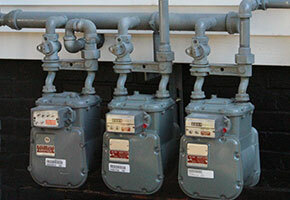 Natural gas is limited to specific regions and may have installation charges for running gas piping from the utility. Heating oil is a low viscosity, liquid petroleum product used as a heating fuel for furnaces and boilers. Oil is an expensive fuel source, often requiring home delivery and increased maintenance compared to natural gas systems. Oil systems coincidentally have the lowest operating efficiency. 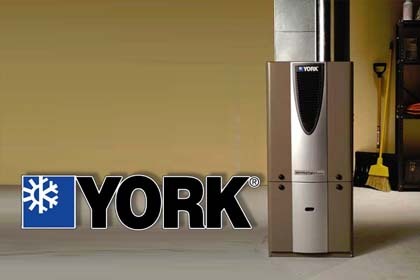 Oil fueled furnaces and boilers are rated at 140,000 BTU's per gallon. Liquefied petroleum gas, also called LPG, GPL, LP Gas, liquid petroleum gas or simply propane, is a flammable mixture of hydrocarbon gases used as a fuel in heating appliances. LP, similarly to oil heat requires home delivery and refinement. LP is typically the most expensive fuel type and is rated at 91,000 BTU's per gallon. Forced hot air (FHA) heating systems utilize four major components: blowers, heat exchangers, burners, and ductwork. A burner fueled by either natural gas, oil or LP heats the heat exchanger to temperature. The blower pushes air over the heat exchanger into the ductwork. From your ductwork the heated air enters your home's conditioned space, making it an incredibly important component. A furnace's efficiency is observed through an Annual Fuel Utilization Efficiency (AFUE) rating. The higher the AFUE the more efficient your gas or oil furnace is. An 80% AFUE furnace converts 80% of the fuel into heat; the other 20% is lost up the chimney. Most furnaces installed in the past 15 years are around 65% to 70% AFUE. Today’s minimum standard is 78% AFUE, but many rebate and tax credit incentives are tied to heating efficiency ratings above 95% AFUE. By installing reliable brands along with properly sized ductwork, LeBlanc Heating eliminates the "drafty home syndrome". Some of the brands we carry include but are not limited to York, Amana, Thermoflo, Maytag, and Goodman. LeBlanc Heating also installs accessories and components such as humidifiers, dehumidifiers, programmable thermostats, air cleaners, air filters and ultra violet purification systems. LX Series furnaces fit your needs with select high efficiency models that reduce your utility bills and a compact 33-inch cabinet that easily fits in tight areas. Ask a LeBlanc salesman if the LX Series furnace is the right application for your home's heating system. 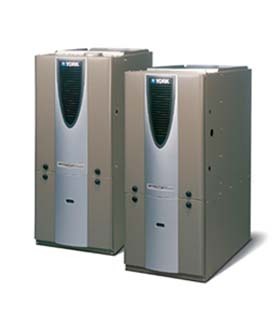 Affinity™ Series gas furnaces come with advanced modulating burners and variable-speed blowers that can match your comfort level more precisely. The innovative ClimaTrak™ Comfort System sets furnace operation to suit your locale. Count on the high efficiency of the Latitude™ Series models to reduce your utility bills. Plus, the compact 33-inch cabinet will fit into your home with room to spare. Ask a LeBlanc salesman if the LX Series furnace is the right application for your homes heating system. 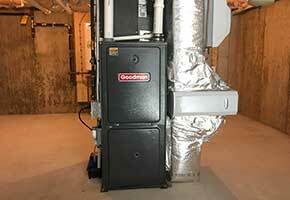 An Amana gas furnace installed by A.J. LeBlanc Heating can achieve an AFUE efficiency rating of 98%. Call LeBlanc Heating today and ask our salesman how a new Amana furnace can save you money. Make sure to ask which systems qualify for HVAC tax credits. 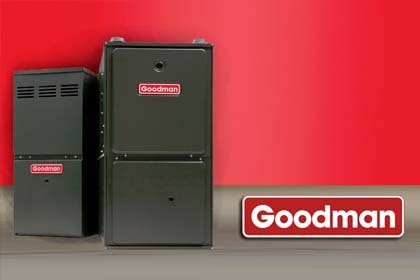 Goodman brand gas furnaces can deliver warm, money-saving indoor comfort year after year to your home. Variable and multi-speed furnaces can provide enhanced indoor comfort by slowly ramping up to your thermostat setting rather than simply turning on at full speed. 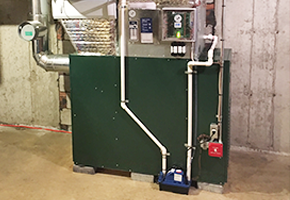 Williamson oil furnaces are available in a variety of sizes and configurations to fit most residential or light commercial projects. Williamson high efficiency furnaces also feature annual fuel utilization efficiency (AFUE) ratings above 80%. Our sales staff suggests Williamson for most oil applications. Yearly maintenance is required for all equipment that LeBlanc Heating installs. Our service department is staffed with NATE certified technicians who handle maintenance. NATE is the leading certification program for technicians in the heating, ventilation, air conditioning and refrigeration (HVAC/R) industry. NATE has the only test supported by the entire industry. 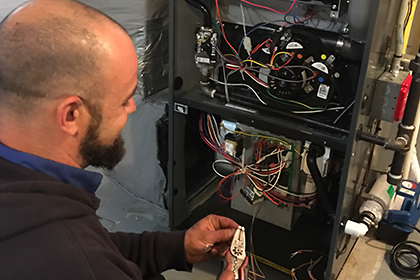 In addition to NATE certifications, all field technicians have their NH Gas Fitters license and are able to install gas appliances. Should any problem arise during our contracting of work performed, we are fully insured.